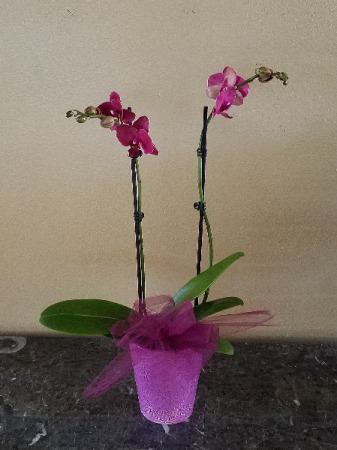 This Purple Orchid Plant Stands a little over Two Feet Tall in a Ceramic Pot with a Tulle Bow. 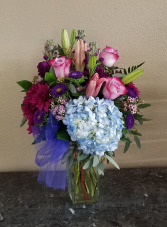 Romantic shades of purples, mauve, and blue in a tapered square clear vase with a lovely mix of flowers including blue Hydrangea, 3 lavender Roses, mauve Asiatic Lilies, purple stock, violet mums, purple Matsumoto, mixed greens and filler accented with a purple Tulle Bow. 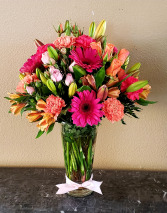 Comes with spray roses, carnations, Gerbera's, Oriental Lilies, alstromeria, fern in a tall vase with a satin ribbon. Stands almost two feet tall. TRADITIONAL VASE DESIGNS Looking for the best value in sending flowers? Let our professional floral designers create a bouquet of seasonal flowers in a beautiful vase.